Facebook censors shared-profits social media site | The Gettysburgian. Facebook has removed users’ ability to link to the rival website Tsū, which allows users to keep a share of the ad revenue on their profiles. It is safe to assume that most people have heard of Facebook, but the majority of people are unaware of Tsu.co, and Facebook wants to keep it that way. 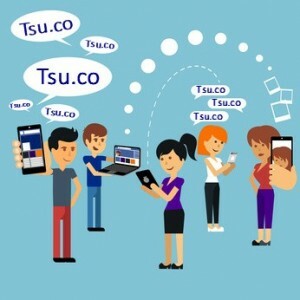 Tsu.co is a new social media site claiming to share 90% of its profits with users, stating that users will receive 45% of profits for posting while the other 45% is shared amongst the community. Users get paid not only for views to their own page, but for views to the pages of members they invited, meaning that there is an incentive to post on Tsu, and to invite others to join and view your and others’ pages. Many users have turned to Facebook and Instagram to do just that. However, as of September 25, Facebook forbids users to post, or even private message, anything in reference to “Tsu.co.” All previous posts involving Tsu.co have been flagged as “spam” or “malicious content” and thus removed from the site. Because Facebook owns Instagram, this ban also extends to that platform’s posts/comments. Facebook and Instagram are social media giants that many businesses rely on for advertisements and as a tool to garner attention in this new digital age. Tsu.co reports that before the block, they received about 2,534 visits per day via Facebook traffic; however, after the block this number plummeted to a fast 0. Many people are upset over Facebook’s censorship of Tsu.co, claiming that the company is intentionally trying to stifle a possible competitor. One woman claims that she was devastated when Facebook removed her nearly 7,500 posts and comments related to Tsu.co. If one woman can post 7,500 Tsu.co links, a growing community of Tsu.co users can do a lot more damage. Facebook has offered to lift the ban if Tsu.co removes its automatic “post to Facebook” option, claiming that this “incentivizes people to share content to both Tsu and Facebook concurrently,” which is directly against Facebook policy. But Tsu.co does not seem to be backing down, and refuses to remove the option. It is unlikely that Facebook feels threatened by Tsu.co, as its grip on the social media market is remarkably tight, and Tsu.co’s main appeal, the ability to make money off of posts, is faulty, and most users have made scanty, if any, profit. But the argument remains; is Facebook out of line? Is it growing too powerful, and bordering on creating a social media monopoly? Though Facebook’s qualms with Tsu.co may be legitimate, so are these questions, and the future is certain to demand answers.